Nothing says fall like the vibrant orange and earthy goodness of my favorite root vegetable. Yams, with their rough and tumble outside and surprisingly sweet inside, are the one thing I always have to have after the long summer months are over. Even though they’re available all year round, they just don’t taste the same to me unless the air is a little cooler, the breeze a little stronger, and the leaves a little yellower. I like to use yams in many different ways; they really are a versatile vegetable, pairing well with both sweet and savory dishes. I like to bake them, roast them, add them to stews and casseroles; sometimes I’ll even throw leftover yams into a nice autumn salad. This time I decided to bake them and stuff them with roasted red pepper quinoa and Mexican chipotle veggie sausages. I let flavored ingredients do most of the work for me, so this one is super easy! 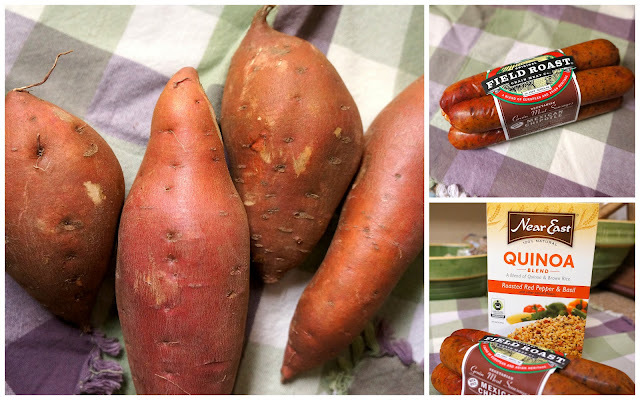 One of my favorite plan-ahead things to do in the fall and winter is to bake yams and potatoes ahead for the week. It takes the same amount of time whether I’m cooking 1 or 5, so I try to get the most bang for my time-management buck! Plus I can throw them in the oven and then catch up on other things while I’m pretending to “cook.” This recipe calls for 4 yams, but feel free to throw some extras in there if you plan to eat them later. Start by preparing the yams for baking. Make sure they’re nice and clean and that any imperfections are cut off. Mine were sitting for a few days so I had a few sprouts to take care of! Once clean and dry, poke holes all around with a fork and coat with a little olive oil. 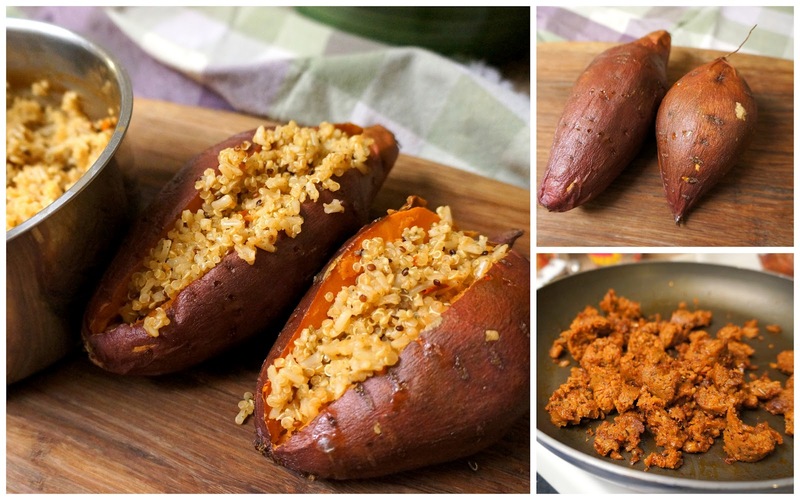 I’ve found the easiest method is to just pour a little on each yam and then rub it in with my hands. Then just toss them in a preheated oven for around 50 minutes at 350 degrees. How long you cook them really depends on how fat they are – the fatter the longer. I like to cook them until they are oozing from the fork holes and are pretty soft in the middle - the softer they are the sweeter and more flavorful they will be. I would like to note that even though you do not need a pan to cook these in (you can simply place them on the racks in your oven) they will ooze quite a bit, so a layer of foil is recommended! Unless, of course, you would like your house to smell like crispy burnt yam for a while…which actually doesn’t smell that bad…I find things out the hard way, people! You now have the next 50 minutes to do absolutely nothing – no chopping, no measuring, no stirring or flipping - nada! What will you do with all your free time?! Ha! I chose to clean, because even when I’m simply baking yams, I still end up with a mess somehow. When your yams are done, set them aside to cool and get your quinoa going (cook according to package directions). When there are about 6 minutes left, crumble up your “sausage” in a skillet with a little olive oil and brown slightly, making sure not to overcook. By the time the quinoa and sausage are done the yams should be cool enough to handle (although probably still pretty hot, so be careful!). Cut a pocket into each yam by cutting a slit down the middle, making sure not to cut the sides all the way down. Fill each pocket with your desired amount of fillings, top with cheese, and throw them back in the oven for about 5min or so. I recommend putting them in a baking dish this time in case yummies fall out. That’s all there is to it! It takes a little time, but if you’ve baked the yams ahead of schedule, this will be a super quick and easy meal. It’s also a great way to get rid of leftovers. Dustin and I both really liked this one, and I’m eager to try some variations with different kinds of fillings. I have a package of smoked apple sausage in the fridge that I want to try next with maybe rice or couscous – can’t wait!